Quality 3/4″ diameter 3-strand twisted poly Dacron rope featuring 6 hand loops every 2′ intervals allowing up to 14 students to participate. Allows solid grip, eliminates sliding and “bunching up.” Available in white, black, tan, red or blue. Poly Dacron: Softer feel and superior strength. Stands up best against UV, moisture and abrasion. USE AND HANDLING: Provide safe play area at and around competition area. Includes soft non-abrasive surfaces free from dangerous debris or obstacle. Do not pull over dangerous terrain, etc. Be sure there is ample space behind each team side to accommodate 1/2 the rope length plus plenty of space for a potential backward thrust. If in a gym or indoors provide wall mats in back of teams. MAINTENANCE NOTE: To avoid rope strands being pulled out of the rope at splice areas we strongly suggest covering and reinforcing this area with a heavy duty tape. If strands do come out, simply twist strand together and reinsert the strand into the rope by following the weave as noted in other splices. Do NOT exceed ½ tensile strength of rope in good condition. Avoid getting manila rope wet and inspect for mildew and/or dry rot, if used outdoors, before each use. Discard if detected. Safe Working Load is 20% of tensile strength of any rope in good condition. Avoid getting manila wet and inspect for mildew/dry rot if used outdoors before each use. 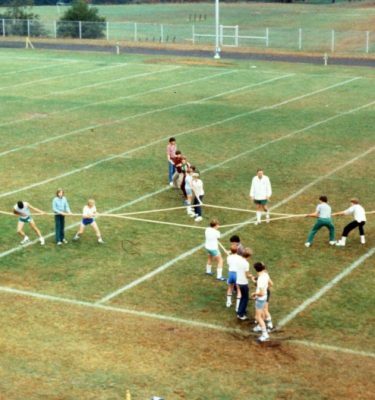 Never let participants let go of rope allowing other side to over compensate and spring backwards. Stop competition as soon as last player passes win line on losing team. Allow approximately 5 ft of rope for “puller” to avoid bunching up (purchase rope length accordingly). Never let anyone pull unless both teams are “ready”. 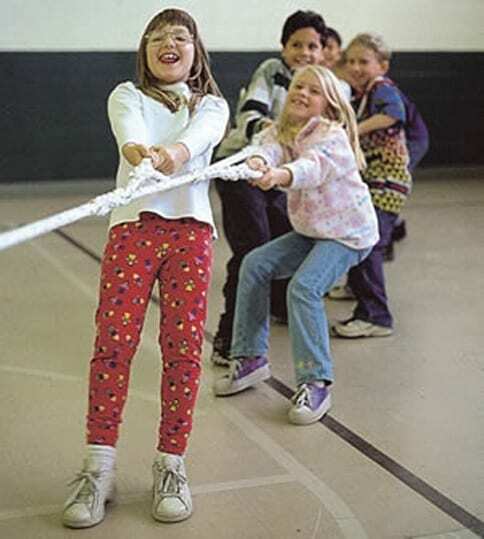 For tug of war ropes with hand loops- never pass arms into “hand” loops. Grab loop with hands only. 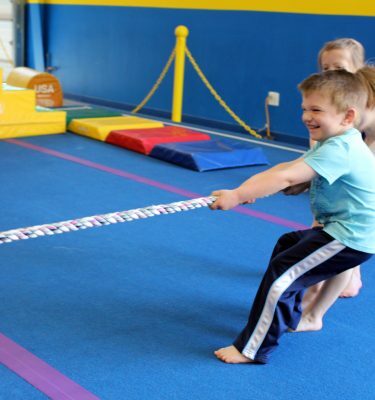 Never let participants wrap rope around and body part to help with grip. Do not exceed ½ tensile strength of rope in good condition. Avoid getting manila rope wet. It is susceptible to dry rot which will cause rope to weaken and break. It also loses 1/3 of rope’s strength when used wet. Keep in dry and cool storage. Dry out completely before storing. Any degradation and/or cut strands replace immediately. 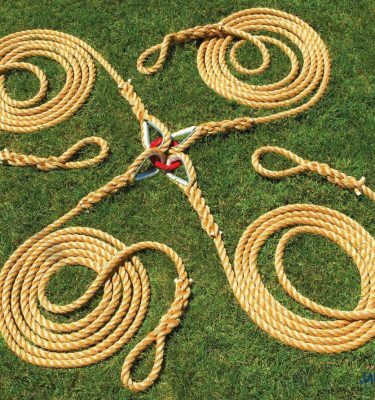 Rope are relatively inexpensive and can be replaced easily. Supervision is needed to ensure a safe completion and play area. Use common sense and limits. Inspect rope before and after each use. Not to be used other than intended.